I've had a rough week in the kitchen, and yes, it's only Wednesday. On Monday, I attempted to make Roasted Garlic and Citrus Chicken and ended up with a half done bird and shattered glass everywhere in my oven. I don't have a roasting pan with rack so I put the bird in a Pyrex dish. After it exploded, I had this overwhelming feeling that maybe I should've known better than to roast a chicken in a glass Pyrex dish. Either way, shards of glass were going off like fireworks on the fourth of July in my oven. Which brings us to Tuesday. I attempted Whole Grain Double Chocolate Muffins only to stop the baking process 8 minutes in due to the smoke from the chicken drippings from the previous night's fiasco. So, I let the oven cool, put Lady H. down for a nap and then deep cleaned the oven. It was gross. So after the oven was cleaned, I put the muffins back in, only to have the bottoms of them stick to the pan when I tried to get them out. Well this evening, I made almond pound cake from a box. Yes, a box. I'm not one of those that thinks I'm above box cake mix. I have issues with canned frosting, but boxed cake mix is my friend. 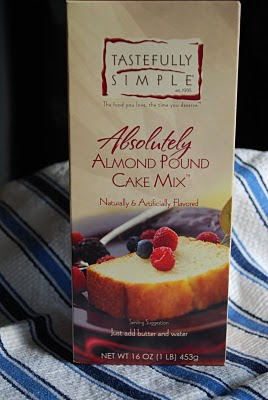 This is by far the best boxed pound cake mix you can get. It's from Tastefully Simple and it's delicious. 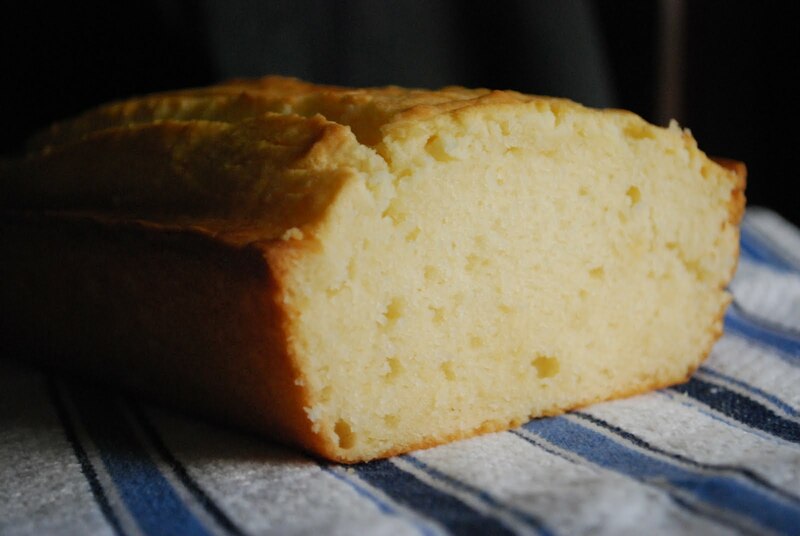 I love almond flavoring and this pound cake is full of it. Just the smell of the batter makes me extremely happy. It's great for breakfast with a cup of coffee and it's great for dessert with a glass of milk. Basically, it's great anytime of day. It also goes great with their Rhubarb Strawberry Fruit Spread. Visit Tastefully Simple's Website and either order or find a consultant in your area for a party because they have lots of delicious and easy mixes that should be staples in your pantry. Now I have to try and find this new almond creation. Made the Danish with almond extract and I like it better! I have been to a few of their parties and I haven't ever seen this mix! Looks great ~ I'm all for the boxed mixes in a pinch! That's so odd, I have cooked chickens in pyrex dishes plenty of times, and never once had an explosion. In fact, I was under the impression that pyrex was somehow special, and could withstand extremely high temperatures... Oh well, guess you better stick to the crock pot!